A distinctive and unique villa nestled against the famous Table Mountain Nature reserve, at the foothills of the majestic and ruggedly beautiful Twelve Apostles Mountain range, capturing the ultimate in Atlantic Seaboard views and surrounding spectacular natural splendor. Being in a most sought after position, in the prestigious suburb of Camps Bay, we capture an all- encompassing panoramic view of the Atlantic Ocean, shore line, pristine white beach of Camps Bay, Lions Head Mountain, Table Mountain, Twelve Apostles Mountain range and a glimpse of Robben Island. The famous, world-renowned Fynbos floral kingdom of the Table Mountain Nature Reserve forms a continuum with the rear garden, where guests can enjoy invigorating walks in the crisp, clean mountain air. As a 4 STAR Graded Guesthouse (Tourism Grading Council of South Africa), guests are assured of “superior comfort and quality with a high standard of furnishings, service and guest care” in a tranquil and beautiful setting. furniture for your comfort. The salt water, rim-flow pool is solar heated to provide guests with a refreshingly pleasant swim after days packed with sightseeing. Sip sun-downers or a glass of superior South African wine, on the well-positioned terrace and indulge your senses with the many spectacular sunsets over the Atlantic Ocean. We serve a delicious Breakfast on the patio with a perfect view of the sea, palm-lined Camps Bay Beach and surrounding mountains. This multi-level villa offers the discerning traveller a selection of stylish and elegantly appointed Luxury Apartments with kitchenettes and Jacuzzi style baths, Luxury and Standard Suites. All Luxury units with Jacuzzi style spa baths. All accommodation has superb sea views from private balconies or decks. 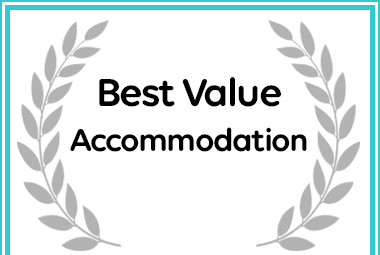 Auberge du Cap has received a Best Value Award for Accommodation in Camps Bay.